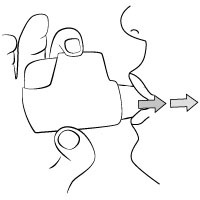 Holding the inhaler horizontally, press and release the coloured button. To confirm that the dose is ready for inhalation, make sure that the coloured control window has changed to green. 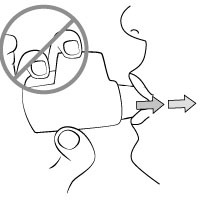 Before placing your lips around the mouthpiece, breathe out completely, away from the inhaler. Place your lips tightly around the mouthpiece. Inhale strongly and deeply through the mouthpiece. If the inhaler is used correctly, you will hear a "CLICK". Continue inhaling for as long as possible, even after the "CLICK". CAUTION: DO NOT HOLD THE COLOURED BUTTON DOWN WHEN INHALING. Remove the inhaler from your mouth and hold your breath for as long as possible. To confirm that you have inhaled the entire dose correctly, make sure that the coloured control window has turned to red. If the control window is still green, inhale again, strongly and deeply, through the mouthpiece. 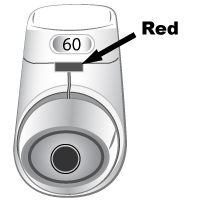 Replace the protective cap on the mouthpiece before putting your inhaler away. 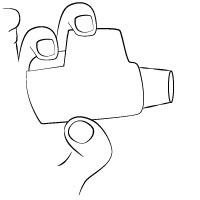 If you wish to clean your inhaler, simply wipe the outside of the mouthpiece with a tissue. NEVER use water to clean the inhaler as this could damage the medicine. If you are having trouble using your inhaler, speak to your pharmacist, he or she will be able to help you.